"ECONOMICS 101 IS NOT A REPUBLICAN CONSPIRACY"
Season 2, Episode 23a: "Big Pink Loser"
I completely sympathize with these strikers. Every person deserves an income they can live on. And you can't survive on $7.25. However, I do not believe raising the minimum wage is the best way to help the working poor. In this post, I'll illustrate the basic economic case that the minimum wage causes unemployment. Before you call me uncaring, keep in mind I'm a progressive at heart. It's just that I believe there are more pragmatic ways to help workers like Terrance without all the unintended consequences. But I'm saving these alternatives for future posts, so hold tight. Patrick Star may be an expert in Wumbology , but he doesn't know much about Econ 101. If you've ever had to take an introductory economics class, you most likely learned what a minimum wage looks like on a graph of the supply and demand for labor, and why it causes unemployment. If so, you can probably skip to Part Two. This first post will just cover the basics. Even if you've been living under a rock like Patrick, once you understand supply and demand it's obvious why the minimum wage is a bad idea. And you don't have to be a "Wumbologist" to see why: if it costs more to hire employees, then all else held equal, businesses will hire fewer of them. 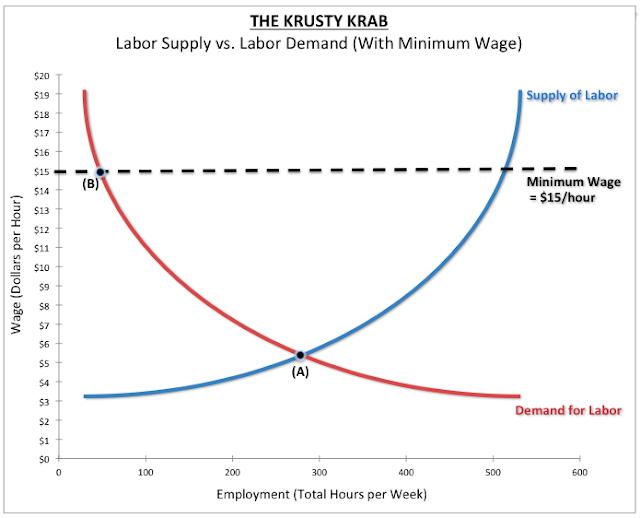 We're going to draw a graph of the supply and demand of labor for the Krusty Krab, the only fast food joint under the sea that hiring right now. This restaurant owned by Captian Eugene Harold "Armor Abs" Krabs -- more commonly known as Mr. Krabs. He currently has two employees: SpongeBob and Squidward. Let's imagine Mr. Krabs is considering whether or not to hire more workers (or fire his current ones.) How will he determine how many employees he needs? Before SpongeBob got hired, Squidward was Mr. Krab's only employee. But even though the restaurant can apparently operate with only Squidward working there, it's way more efficient to hire a second employee: one to run the cash register and another to grill the Krabby patties. In the first episode Mr. Krabs found that out the hard way: five busloads of of hungry anchovies decided to have lunch there at the same time. With only Squidward working there, the Krusty Krab was overwhelmed and couldn't serve the swarm of customers. The next day Mr. Krabs put a "Help Wanted" sign in the window, because he realized that having one additional employee could allow him to make a lot more money. For this reason, wages would have to increase by a whole lot before he'd fire either of these first two workers. But if Mr. Krabs kept adding more and more employees, eventually there'd simply be too many fry cooks in the kitchen: the Krusty Krab only has one grill, after all. At that point, each extra employee wouldn't be likely to generate enough additional revenue to justify their paycheck. 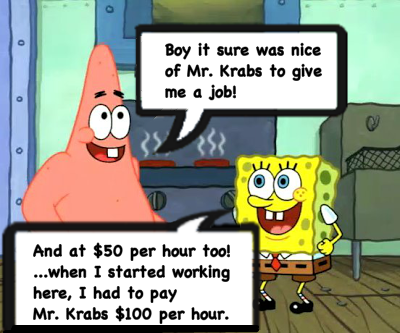 If this were the case, wages would have to be pretty low for Mr. Krabs to hire anyone else. Mr. Krabs lives by the philosophy is that "the money is always right," which is why he never pays a penny more than he has to. Mr. Krabs may be a fictional cartoon character, but just like everyone in corporate America, his goal is to maximize profit. Therefore, a business will only hire someone if having this additional employee on staff will make the business more money than it costs to employ them. With this principle in mind, I've drawn Mr. Krab's labor demand curve below. 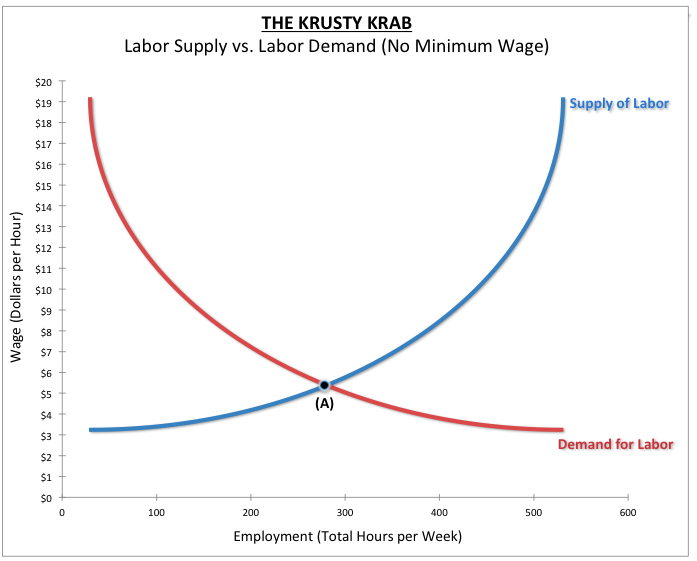 This shows the relationship between the hourly wage and the number of hours Mr. Krabs would be willing to pay his employees to work. Unfortunately, I was unable to find accurate employment data for Bikini Bottom. So the precise numbers used in this example were made up for the sake of concreteness. Be aware that the slope of the curves does make a difference. But rest assured, the basic shapes of the graphs shown here are pretty much ripped out of the first page of any intro to econ textbook. On the horizontal axis, we have employment, measured as the total number of hours all the fast food employees at the Krusty Krab worked per week. On the vertical axis, we have the wage rate in dollars per hour. The labor demand curve shows the total hours of labor per week for which Mr. Krabs would be willing to pay, given every possible hourly wage from $0 per hour to $20 per hour. This curve slopes downward. That's because the higher the wage, the fewer employees Mr. Krabs is willing to employ. So, how much money would it take to convince you to flip Krabby patties? For me it would have to be a lot, since if I worked at the bottom of the ocean I would probably drown. But SpongeBob loves working there, so he'd probably work for way less. The relationship between the wage rate how many hours employees are willing to work is illustrated by the labor supply curve, shown in blue on the graph below. The blue labor supply curve slopes upward: the higher wages are, the more job applicants are willing to work there. On the graph, notice the supply of labor approaches zero when the blue curve intersects the vertical axis just above the $3 mark. This tells us no one is willing to work at the Krusty Krab for only $3 per hour. SpongeBob may love flipping Krabby patties, but he's got a pet snail to feed, and if he couldn't afford Gary's snail food, he might have to work for the Chum Bucket instead. As we move to the right along the labor supply curve it gets steeper. That's because if SpongeBob were already working full-time, then if Mr. Krabs were to ask him to work even more, it would cut into the free time SpongeBob has to go jellyfishing. So to convince him to work an extra hour, Mr. Krabs would have to increase his pay by more than he would if SpongeBob were only working part-time, and therefore could work a little longer and still have enough daylight to catch a few jellyfish. The market equilibrium is where the two curves cross. First Mr. Krabs hires whoever is willing to work for the least amount of money -- because there's plenty of fish in the sea, and they all need jobs. Then he continues to add employees until the amount he'd have to pay to get more people to work for him is greater than the revenue they would bring in. 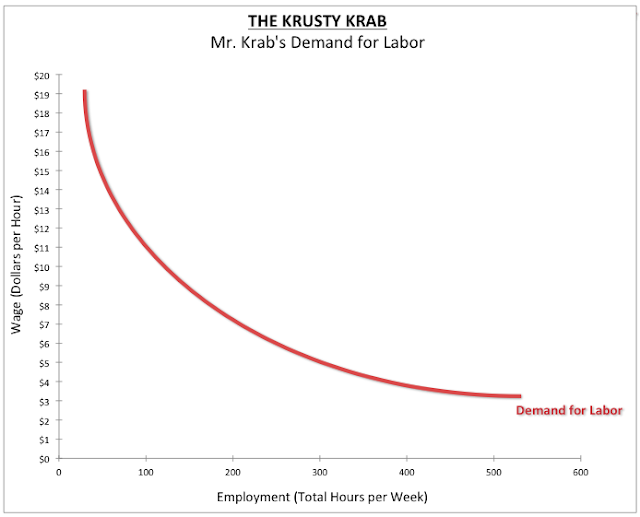 At that point, Mr. Krab's demand for labor will be the same as the supply of labor. If there were no minimum wage, the market would settle at point A, with 280 hours of employment per week at $5.25 per hour. That means Mr. Krabs would hire seven full-time employees who each work 40 hours per week. Now let's imagine that the Krusty Krab employees have been angling for a raise, and the Mayor of Bikini Bottom takes the bait by establishing a minimum wage of $15 per hour. This is represented by the black dashed line on the graph below. The new equilibrium is at point B. At a wage of $15 per hour, Mr. Krabs is only willing to purchase 40 hours of labor per week, which is only one full-time employee. That means Mr. Krabs will have to decide whether to fire SpongeBob or Squidward -- I'm talking Sophie's choice style. On one hand, if Mr. Krabs decided to fire Squidward and let SpongeBob keep his job, then the minimum wage would guarantee SpongeBob a pay raise, and he'd finally be able to afford the mortgage payments on his pineapple. But if instead Mr. Krabs decided to keep Squidward and fire SpongeBob, what would become of this poor innocent sponge who's only life goal was to be a fry cook? Ask yourself this my friend: if you were the Mayor of Bikini Bottom and your misguided minimum wage policy got SpongeBob SquarePants fired, how would you sleep at night? After the minimum wage is introduced, the workforce as a whole ends up with less income. Before, Mr. Krabs was paying for 280 hours of labor per week at $5.25 per hour, which equals a total of $1470 per week for the workers. But with the $15 per hour wage floor, we end up with only 40 hours of labor and $600 total per week for the workforce. The result is that as a group, the workers end up making less than half as much total income. When the minimum wage comes up for debate, a lot of my fellow progressives rant about how profitable companies like McDonald's are. Can't these corporations "afford" to pay their employees more, they ask? Arguments like this suggest that many of these advocates don't understand the basic economics of the labor market. Yes, McDonald's could afford to give away a bunch of money to their employees if they wanted. And yes, all workers deserve an income they can live on. But that's not relevant to how businesses make hiring decisions. Just like Mr. Krabs, McDonald's only hires employees if they will generate more in revenue than they're paid. If we raised the hourly wage floor to $15, it wouldn't matter what you think people deserve, because the actual consequences would be disastrous. Every employee who doesn't generate more than fifteen dollars for McDonald's shareholders every single hour they're on the clock would immediately lose their job. And guess what? These people will make zero dollars per hour. I would love it if we could wave a magic wand and increase the income of the working poor without any unintended consequences. But that's kind of like believing we could solve poverty simply by making it illegal to be poor. For the discipline of economics, the laws of supply and demand are more fundamental than the law of gravity. So if we're wrong about this basic supply and demand story, then the fibers of economic theory start to unravel, at which point the entire discussion becomes moot because apparently nobody knows what they're taking about anyway. Therefore, the burden of proof is on the proponents of the minimum wage. Unless they've got a really damn good reason to believe that there is some crazy fluke with the low wage labor market that turns the laws of economics on their head, that changes the rules of the game for this particular case in some weird way that apparently doesn't affect anything else in the world, then we should assume by default that the law of demand holds true: if something costs more people will buy less of it. And this applies to labor as much as it does to everything else. There are many reputable left-leaning economists (with whom I usually agree) that support increasing the minimum wage. My next post will explain and refute their best arguments. "IF YOU LIKE YOUR JOB YOU CAN KEEP IT"